LONG ISLAND CITY — When Deno Charalambous moved from Greece to Queens at age 14, he didn't speak a word of English. He quickly learned that his new neighborhood wasn't going to help him learn the language, either. Astoria in the 1970s was so heavily populated by Greeks that he rarely heard his neighbors or schoolmates speak anything else, he said. "I said, 'Ma, I'm not learning the language — how am I going to better myself if I'm speaking my own language all the time?'" Charalambous recalled asking his mother at the time. So he transferred to Aviation High School in Long Island City, just a neighborhood over, where he thought he'd have a better chance of meeting some non-Greek speakers. That was about all he knew about the school he'd picked, he said. "I was going here for about six months," Charalambous remembered. "[One day] I was sitting at home with my sister's boyfriend, and he's asking me where I'm going to school and I said Aviation. So he goes, 'Oh, so you're a mechanic.' And I said, 'Mechanic? I'm not a mechanic.'" "I came to this school and I had no idea what it was about," he laughed. "I just wanted to get away from all the Greeks so I could learn the language." Four years later, he graduated from the school with aviation mechanics' certification, then headed off to work in the industry. In 1997, he returned to Aviation High School — first as a teacher, then as assistant principal. Today, he's principal at the school, which teaches a student body of 2,200 kids the ins and outs of fixing airplanes through a curriculum certified by the Federal Aviation Administration. The school, located at 45-30 36 St., takes up an entire city block. In addition to its traditional classrooms, there are 33 full-sized aviation warehouses and 17 real aircraft on campus for students to practice on, plus a sister-campus at JFK Airport, complete with a Boeing 727. Q: Tell us about Aviation High School, and what your students learn here. A: Aviation High School has been around for almost 80 years now. 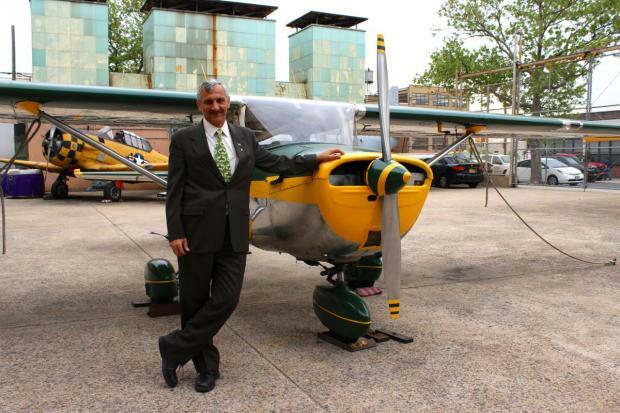 Our main focus is to train New York City youngsters to be aviation maintenance mechanics. We've been doing it a long time. We're the largest aviation school in the country. We graduate more mechanics licensed by the [Federal Aviation Administration] than any other institution in the country. That's a tremendous responsibility, and we're very proud of it. Q: What's expected of the students who come here? A: It's a very hands-on school. We do everything from woodworking, composites, electricity, metal work, welding. The kids do everything. At the ages of 14 to 18, they have to take the Federal Aviation curriculum, plus the regents curriculum for New York State, so they're doing two things at one time. These kids really outperform everyone out there. Q: How do you balance traditional academics with the vocational studies? A: The students' day is divided into two parts. When the student comes in their first year, they take all their academic classes, plus one aviation class, just to get familiar with it. In the [sophomore] year, they take all the academic classes plus three periods of shop every single day. In their junior year, senior year and in the fifth-year program, they take four periods of shop every day, plus all the academics. It’s a very long day. Our students have the longest day of any student in New York City. The average student is here from 8 in the morning to 4 in the afternoon. Q: What did you do after you graduated from Aviation, and how did you end up coming back to work here? A: I graduated from here and I went straight into the industry. I came from a very poor family and couldn't afford college, so I went straight to work as a mechanic. Then, after four years of working as a mechanic, I went to college in the evening and I became an accountant. A few years later I went back to school and I got a second degree in education, and I started working here in 1997. I've been here ever since. The reason I came back was because I wanted to give something back to the school. Everything that I've done, I owe to this school. Q: What's your philosophy as an educator? A: I have a lot of philosophies. One of them is to lead by example. I would never ask someone to do something I haven't done myself. And I really believe in the kids. Recognize every student as an individual. Help one student at a time. Even if I have 2,000 students, if I can help one student overcome their difficulties and succeed, then I've done something in my life. Q: What's a typical day for you like? A: I'm here before 6 o'clock every morning; I'm at the entrance of the building every morning when the kids are coming in. And I'm here every evening. So I put a very long day in. This school is my life. Q: What is it that draws students to Aviation High School? A: We get a lot of kids that have siblings, that have uncles, that have aunts, fathers, parents — they know somebody that went to the school and told them how great the school is. The other set we get is kids that know the school is a very safe school, and a very good school. Even if they don't have an interest in aviation, they come here because the school is safe. It doesn't hurt that we have six As in a row on our progress reports. We're a great school. And we get a third set that thinks the school teaches pilots. Which we don't. [But] we do have a tremendous amount of our graduates that [go on to] become pilots.